This book predicts the decline of today's professions and introduces the people and systems that will replace them. In an internet-enhanced society, according to Richard Susskind and Daniel Susskind, we will neither need nor want doctors, teachers, accountants, architects, the clergy, consultants, lawyers, and many others, to work as they did in the 20th century. The Future of the Professions explains how increasingly capable technologies - from telepresence to artificial intelligence - will place the 'practical expertise' of the finest specialists at the fingertips of everyone, often at no or low cost and without face-to-face interaction. The authors challenge the 'grand bargain' - the arrangement that grants various monopolies to today's professionals. They argue that our current professions are antiquated, opaque and no longer affordable, and that the expertise of their best is enjoyed only by a few. In their place, they propose five new models for producing and distributing expertise in society. The book raises profound policy issues, not least about employment (they envisage a new generation of 'open-collared workers') and about control over online expertise (they warn of new 'gatekeepers') - in an era when machines become more capable than human beings at most tasks. Based on the authors' in-depth research of more than a dozen professions, and illustrated by numerous examples from each, this is the first book to assess and question the future of the professions in the 21st century. In this magisterial survey Richard and Daniel Susskind demolish each profession's faith in its immutable uniqueness. Instead they trace inexorable and universal forces that will drive disintermediation, deconstruction and disruption. Written with scholarly thoroughness, this is an urgent manifesto and practical blueprint for the leaders of every professional firm. 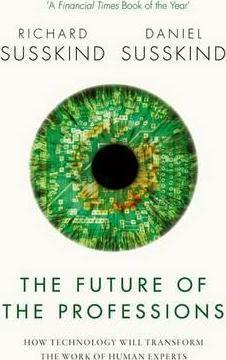 * Philip Evans, Senior Partner & BCG Fellow, The Boston Consulting Group * I know of no better book for anyone interested in the future of skilled jobs and society. Drawing on an astounding range of sources and the latest research, The Future of the Professions offers vital insights into the unprecedented disruption facing all the professions. * Professor Ian Goldin, Professor of Globalisation and Development and Director of the Oxford Martin School, University of Oxford * Impressive new book * Edward Fennell, The Times * If the Susskinds are right we are at the start of a social revolution. Technology has begun to transform social class, economic activity, political discourse, working life and the limits of human activity. In The Future of the Professions they relentlessly and unyieldingly but also entertainingly and elegantly set about proving their point. I started knowing that their argument was important, I finished convinced that it was right. This is a necessary book. into more than 10 languages, and he has been invited to speak in over 40 countries.